The historic venue of Lord’s, London was the venue for the 2nd ODI between England and India. Having a 1-0 lead in the 3-ODI series, the visitors would have hoped to seal the series. But the hosts were in no mood to give up just yet. In what turned out to be a one-sided game, England finished on the winning side and got the equalizer. It was Eoin Morgan, the English skipper, who called the right side of the coin. To the surprise of everyone, he opted to bat despite India being so clinical in the chase in the last game. Just like Trent Bridge, the openers gave England a flying start. The Indian seamers didn’t extract any swing and the surface aided the batsmen. Jonny Bairstow was the aggressor initially with Jason Roy enjoying the show from the other end. But he didn’t waste too much time in hitting his stripes and there were explosions from either end. After 10 overs, the score raced off to 69/0. The pattern was pretty similar to the last game and a Kuldeep Yadav intrusion was customary. He was introduced into the attack in the 11th over and off the 2nd ball, he castled Bairstow for 38. A few moments later, he sent back Roy as well for 40 and it seemed as if the Nottingham script was being played again. But Joe Root and Eoin Morgan were prepared to guts it out this time around. Kohli removed Kuldeep from the attack after he bowled 4 overs that gave a bit of breathing space for the batsmen. They handled themselves very well and rebuilt the innings. Without taking too many risks, the scoreboard was ticking and reached 152/2 at the halfway stage. Both brought up their fifties and with 20 overs to go, the hosts had a great platform at 185/2. Kuldeep was brought back in the 31st over and immediate was the recoil as he accounted for the wicket of Morgan for 53. Ben Stokes didn’t last long and Hardik Pandya sent him packing for 5. Umesh Yadav caught the big fish when Jos Buttler was dismissed for just 4. After 40 overs, England had mustered to 228/5 and they were in danger of falling short of a competitive total. Chahal made it even more difficult by getting the wicket of Moeen Ali in the 42nd over. Root was still at the crease and was fast approaching the 3-figure mark. David Willey was the No.8 batsman and he played a vital cameo. 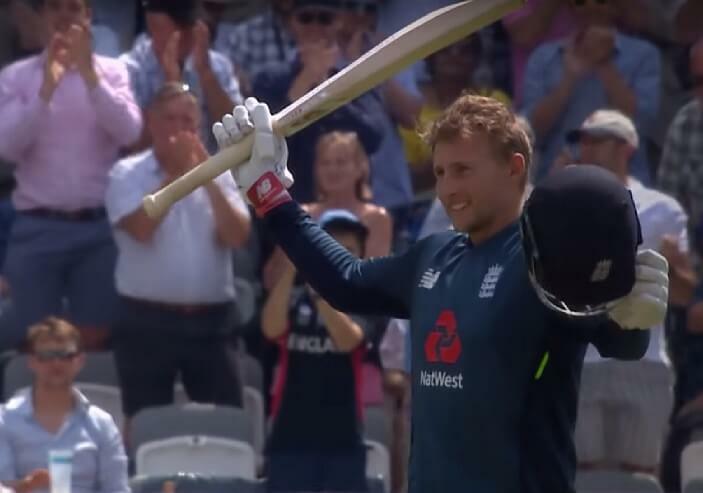 Root got to his 12th century in ODI cricket and Willey scored 50 from 31 balls to boost the score to 322/7 from 50 overs. India, having a mighty in-form batting line-up, were well in the hunt. They got the kind of start they were hoping for. It was Shikhar Dhawan who, after weathering the initial storm, played some handsome strokes. On the other hand, Rohit Sharma didn’t seem to have the same fluency as the last game where he scored a century. The Men in Blue had scored 49 runs in 8 overs but Rohit was edgy and in the hunt to break the shackles, played an ugly heave and had his stumps castled. Dhawan, who had gotten another good start, threw it away once more and got out courtesy of Willey. KL Rahul had a shocker and departed without scoring when Buttler pulled off a stunner behind the wickets off the bowling of Liam Plunkett. India were down to 61/3 after 11 overs. Virat Kohli was still at the crease who now had the company of Suresh Raina. The duo brought some stability to the chase and focussed on collecting the ones and twos. Without breaking too much sweat, they kept the scoring going. After 25 overs, the score got to 132/3 and Kohli’s knock was also shaping up well. But Moeen Ali struck gold when he trapped Kohli in front for 45. That was the decisive blow for India and proved to be the turning point as England came roaring back. Raina felt the need to up the ante and in trying to go over mid-wicket, he was bowled by a googly from Adil Rashid for 46 off 63. MS Dhoni was struggling against the spinners on a surface that was slowing down. Hardik Pandya also found it hard against the turning ball. Moeen and Rashid tightened the screws and ran away with the game. There was too much left for Dhoni to get and he perished after scoring 37 off 59 balls. In the end, India were bowled out for 236 which gave the hosts a victory by 86 runs.